Vehicles on the road still had their headlights on when I joined the traffic gridlock I had gotten used to, while still being a good three kilometres away from the office. Residing in a suburb south of Kuala Lumpur, I had, as usual, hit the road well before first light last Monday. As I joined the crawl, in front of me was a car driven by a lady whom I initially thought was driving alone and, like everyone else that morning, was heading to her place of work. When I noticed that she was acting as if she was talking to someone, I thought that she may be speaking over her in-car telephone system, or perhaps singing to a tune from her radio. But soon, I saw her occasionally turning to her left and back, and not long after, saw her hands flailing about. Each time she did so, her car swerved left and right and, at least once, motorcyclists doing what is called the “lane splitting” manoeuvre to squeeze through the bigger vehicles, honked at her. It was when I finally decided to overtake her because of her dangerous driving that I noticed why she was acting that way. The car driven by the lady had two child seats, one in front and another at the back. In each of the seats was a toddler, presumably her children. As she was driving, I noticed clearly she was bothered by the actions of the two toddlers. Few children enjoy being restrained in child seats of a car. Apparently, she was scolding them for reasons unknown and each time that I saw her hands flailing about, she was, in fact, hitting them, perhaps trying to keep them still as she drove. Life must be tough for the poor lady. She must have left her home, like everyone else in that mad gridlock, very early that morning. She probably had to prepare breakfast for the family and later the mammoth task of getting herself and her children ready for the morning commute. As I noticed that she was already dressed for the office, she most probably had to send her toddlers to a child minder somewhere first before clocking in. Then, there was that perpetual and energy-sapping traffic jam she had to contend with before she got to wherever it was she was going. She would be mentally exhausted by the time she gets to the office, where other challenges await. There would be meetings, organisational targets to achieve, people to deal with and deadlines to meet. And when she’s done with the office, she would have to repeat the routine in the evening, this time, heading the other way, only to face other tasks that as a mother, she would have to perform at home. Like her state of being and mind when she gets to the office, she would surely be a spent force by the time she goes to sleep every day. But still, her mind cannot afford to rest. On top of her thoughts would probably be financial issues and possibly of the future she is trying to build for her children in an increasingly tough environment. There are a host of expenses to budget for, especially these days, when raising children is a very expensive responsibility. Little wonder then, that household debt among Malaysians has remained consistently high. Most have no choice but to submit to the devastating 18 per cent annual interest rate charged by credit cards to get by. I wondered about the percentage of the Malaysian population now with a positive net worth, even after accounting for their compulsory savings in funds such as the Employees Provident Fund. I am quite sure that it is low, especially since the average mortgage tenure in Malaysia is 30 years and the fact that many, I noticed, are forced to stretch their vehicle hire purchase period to the maximum nine years and getting by with paying only the minimum required in their credit card statements. In reality, many will toil every day just to service their debts while constantly dicing with the danger of being certified as financially “insolvent”. But many, like the lady driving in front of me on Monday, have little choice. Most jobs are here in the city and owning a car has become a necessity instead of a luxury. Like many too, she either could not find a place closer to her office or owning a house was simply beyond her financial reach. So, she had to commute, like all of us who were there in that sickening Monday morning traffic gridlock. No mother enjoys beating their own offspring. Her actions that morning had the word “frustration” written all over it. She probably had reached the tipping point. 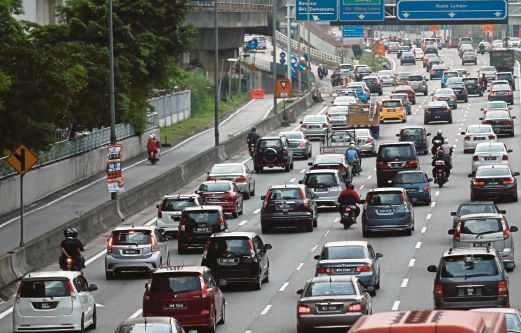 Still in the traffic crawl, my mind wondered to a piece of news I read some time ago, which said a staggering 90 per cent of youths in rural areas make a beeline for the city immediately after sitting their Sijil Pelajaran Malaysia. I was like them, too, when as a youth, I could not wait to leave the kampung and my one street town for Kuala Lumpur. I was tired of the then seemingly hopeless place which promised nothing. Looking forward to the bright lights of the city and the promise of a future much brighter than the gasoline lamp that brightened my nights in the kampung, I eventually left with what education I gained from school and a bag of dreams. Generally, Kuala Lumpur has not let me down. Like millions of others, I have been making a living in the city and, in between, managed to raise a family. But, what I saw in the traffic jam on Monday made me realise that even in our search for a better life and for our own future, there will always be trade-offs. We just simply won’t win everything. There still is no traffic gridlock in my small hometown even to this day. I never had to swear when driving there and life seems to proceed at a very comfortable pace for someone now well past his youthful years. At times such as last Monday, I could not help but realise that for all that I had gained, I had lost some, too. Mustapha Kamil is the newspaper‘s group editor. The profession has taken him to all corners of the globe.